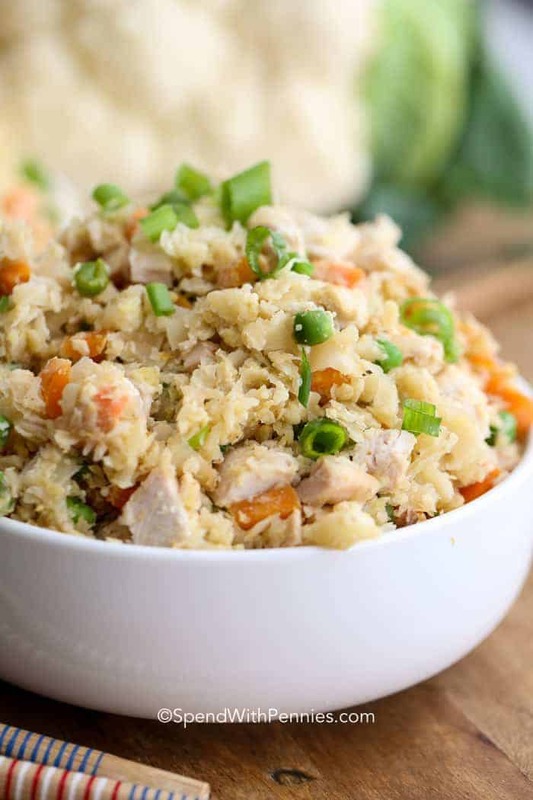 Cauliflower Fried Rice is one of my go to meals for lunch! As much as I love homemade fried rice, sometimes I’m just want a lighter alternative (it’s keto friendly too)! Swap out cauliflower rice for white (or even brown) rice in a traditional fried ripe recipe. This not only tastes great, it makes for a lower carb and lower calorie side dish that I can’t get enough of! Add in any veggies and any leftover protein you may have for the perfect meal! 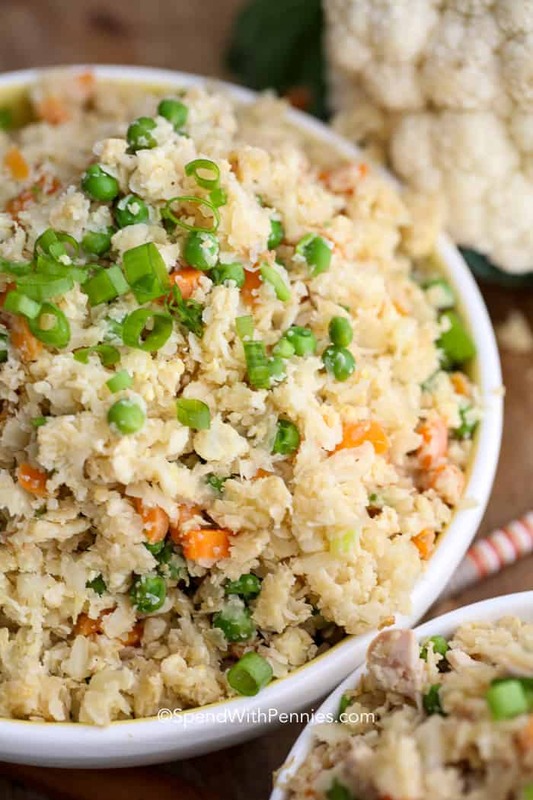 This Cauliflower Fried Rice recipe is surprisingly easy to make and the end result is an amazing dish that works as both a side and main dish! Riced Cauliflower: Shred cauliflower with a cheese grater to make it similar in texture to rice. It will absorb the flavors from the seasoning that you cook it with. Great as a Meal or Side: Cauliflower fried rice is the perfect weeknight dinner, and a great way to use up any leftover meat or vegetables in your fridge. If you’re serving another type of meal (like Grilled Pork Teriyaki) this also makes a great side! Use Leftovers: This is a great way to enjoy leftovers in your fridge. Shrimp, pork, beef, celery, peppers, carrots… the list of amazing things you can add doesn’t end! Just chop ‘em up and add them to the pan! This recipe starts with a base of riced cauliflower. It takes just minutes to make. Cauliflower rice is not technically rice but it has a similar texture and works great as a replacement for rice to cut carbs and calories. 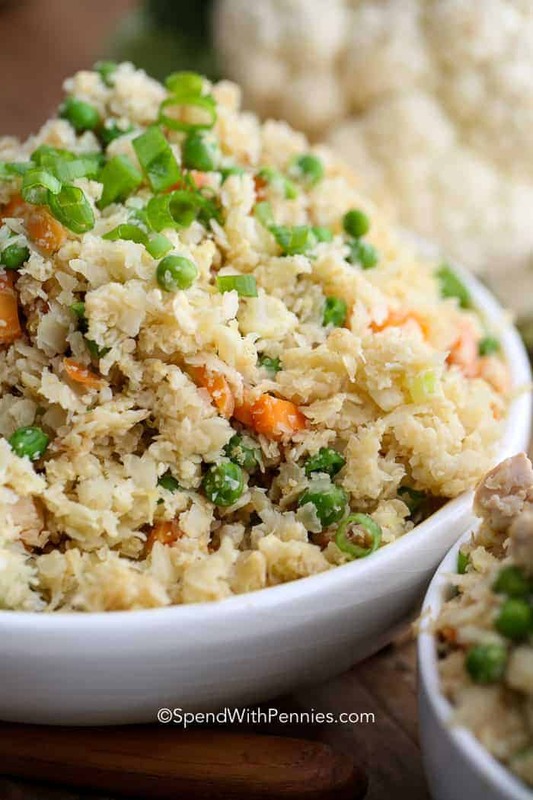 Cauliflower fried rice is made by grating cauliflower into a rice-like consistency. Making cauliflower into rice is simple and easy but can often find shredded cauliflower in the freezer section of your local supermarket, but it is cheaper to make it yourself (plus I prefer the texture of homemade)! Trim the leaves and stem from a head of cauliflower. Rinse and pat dry. 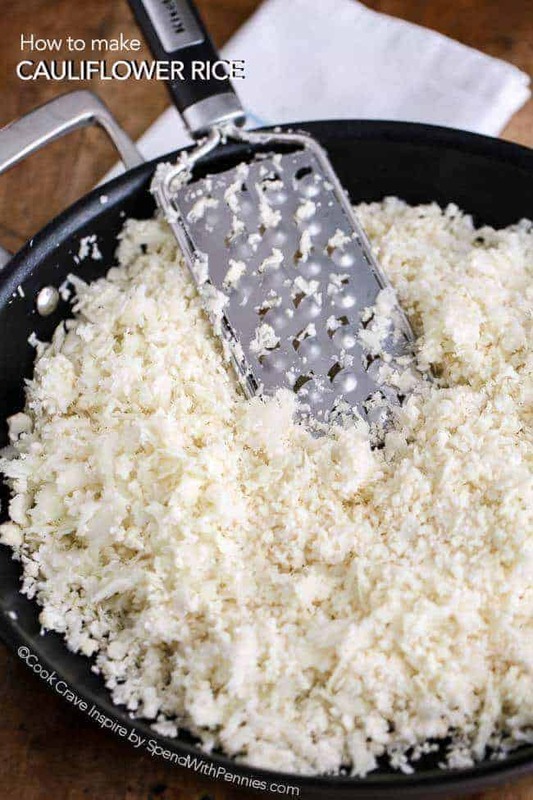 Using the larger holed side of a grater, shred the cauliflower to achieve a rice-like consistency. (Or use a food processor). Cook in a touch of olive oil until tender. Riced cauliflower doesn’t need to be boiled or cooked before it is added to your dish, so this ends up taking a lot less time to make than a traditional fried rice! Cauliflower Fried Rice keeps very well in the fridge in an air-tight container. It also reheats well! I have had great success with making this for lunches throughout the week! Here are the full, in-depth instructions to make the perfect cauliflower rice at home! Is Cauliflower Fried Rice Good for You? 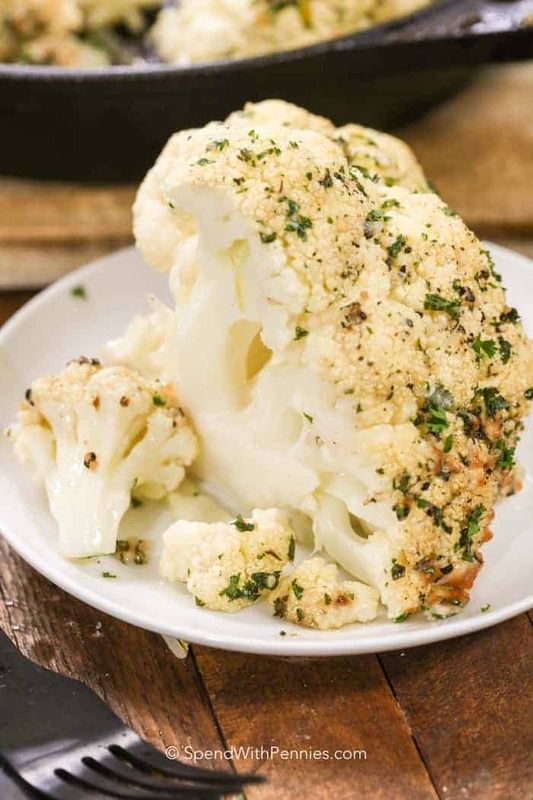 Cauliflower has become a cooking fad recently, and for good reason! It is often substituted for a high-carb option in dishes because it is so low carb, and low calorie. 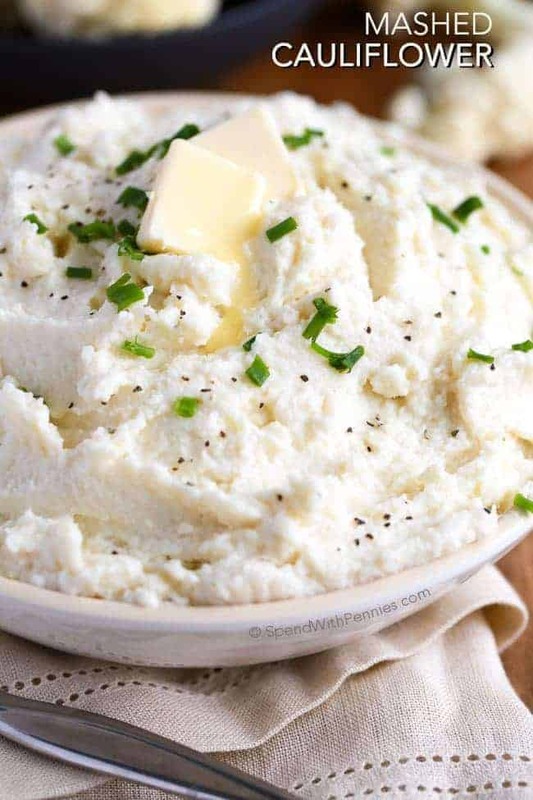 The mild flavor lends itself well to many recipes and it is the perfect lower calorie substitution for rice or potatoes in many dishes including our favorite Cauliflower Mashed Potatoes! This dish replaces rice with cauliflower, but doesn’t change the amazing fried rice flavors you know and love. I love making cauliflower fried rice with chicken when I am entertaining friends, it pairs amazingly with other asian-inspired dishes like these Asian Beef Skewers! All of the flavor of fried rice without the carbs! Whisk together egg & milk. Pour in a large pan over medium heat. Cook just until set, remove and set aside. Heat oil in a no stick pan over medium heat. Add in garlic & ginger and cook until fragrant. Add carrots & peas, cook an additional 5 minutes. Add raw riced cauliflower and continue to cook until cauliflower is slightly softened (about 5-6 minutes). Stir in egg, soy sauce & green onion.